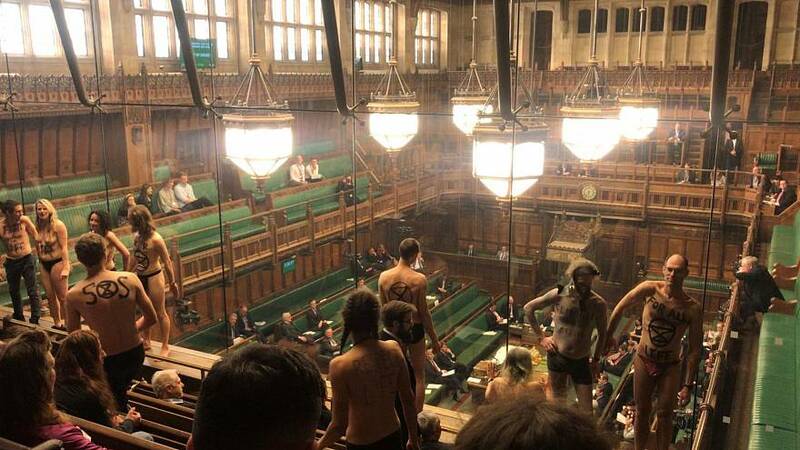 Eleven protesters from the climate change group Extinction Rebellion stripped off in the House of Commons as MPs prepared for a second round of indicative votes on Monday. The activists' Twitter account said they took to the public gallery to call attention to the ‘elephant in the room’. Lorna Greenwood, Media Coordinator for Extinction Rebellion told Euronews that the term ‘elephant in the room’ refers to having huge or obvious problem that no one wants to talk about. “We are being distracted by Brexit when we should be focusing on the ecological and climate crisis which is a threat to all of us," Greenwood told Euronews. According to Greenwood, the activists arrived at the Commons in normal business attire before being showed to the public viewing galleries without a second thought. Once settled, the 11 demonstrators quickly stripped off their outer garments, turning their backsides towards Britain's lawmakers. Greenwood, who was not one of the 11 demonstrators, told Euronews the members were approached by police and that arrests were potentially made. The impromptu show came as Labour MP Peter Kyle was opening the debate for his motion which will be voted on later on Monday. Kyle was praised for his ability to focus and keep the address going while such an extraordinary distraction was occurring. However, it did somewhat turn into a pun competition with Kyle himself leading the way and others chipping in. An unusual way to get 'behind' an amendment, certainly.